The MyPhone Iceberg! Specs + Features + Promo! - All Chucked Up! You are Here >> Home >> Rave >> The MyPhone Iceberg! Specs + Features + Promo! First thing you’ll notice is that the MyPhone Iceberg is BIG! It sports a 5.7″ screen that just screams awesomeness. The next thing that’ll catch your attention is the Iceberg’s sleek and sophisticated aluminum body. Yes! ALUMINUM! Gone are the flimsy breakable plastic bodies we’ve all gotten used to. Love taking pics? Then this baby is for you! The MyPhone Iceberg boasts a 12-Megapixel rear camera for shooting amazing high resolution images PLUS it’s got an impressive 5-Megapixel front camera! #selfie pics will look way better with this device! LOL! Want to know more about the MyPhone Iceberg…? Here’s more…! Crazy, right?! 16GB of internal memory, Android 4.2.1, 1.2 GHz Quadcore, Corning Gorilla Glass 2, Wireless Display, Clever Motion, their exclusive “Theft Apprehension & Asset Recovery Application” (TARA) and so much more! I’m excited just talking about it! I’ll be doing an experiential review on it next week when my unit arrives on Monday. I’ll be posting raw unfiltered images using the Iceberg’s front and rear cameras as well as test all of its new features. I’m also particularly interested to try out Iceberg’s TARA feature. 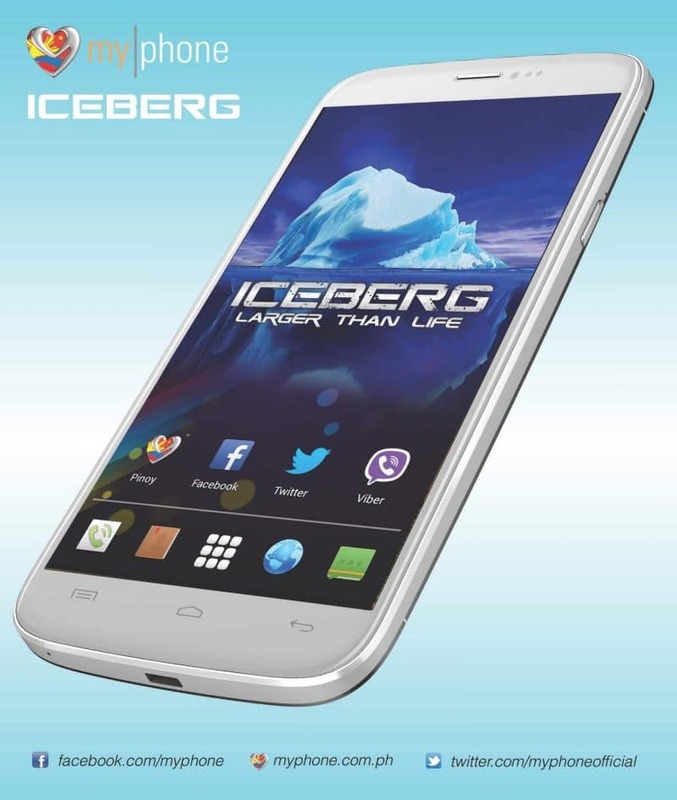 Here’s the bottom line – The MyPhone Iceberg is reasonably priced at Php 11,988.00 only. 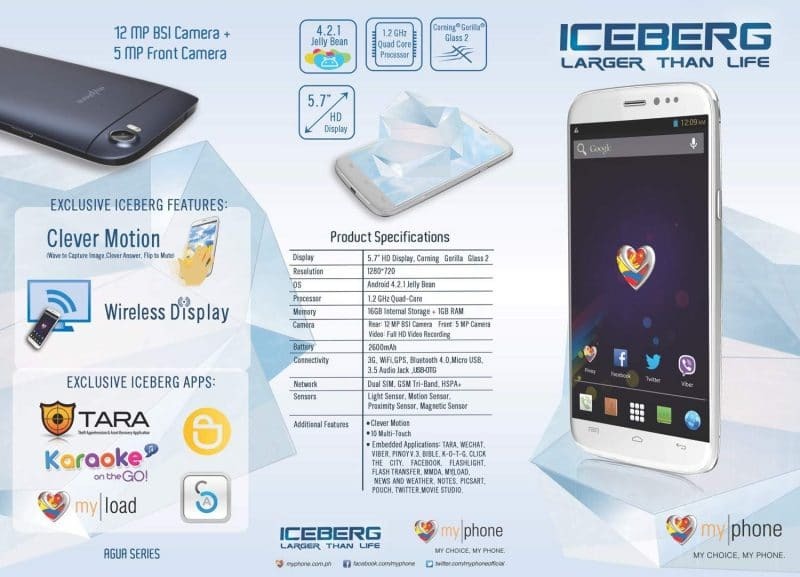 If you’re excited to get your hands on the MyPhone Iceberg, then make sure to free up your schedule for the MyPhone Iceberg Meltdown Promo happening at Eastwood City Walk on July 26, 2013 from 4PM-12MN! Apart from the fact that the MyPhone Iceberg will be sold during that event, credit card holders will be happy to know that they can purchase MyPhone’s awesome device on instalment at 0% interest! It’s gonna be all sorts of wonderful. I’m definitely gonna be there to join in on the festivities, as well… So, if we happen bump into each other during the event, don’t hesitate to say hi, ok? There you have it, folks! Everything you need to know about this kickass Pinoy phone. Get ready to upgrade your coolness to iceberg levels! The MyPhone Iceberg is here. Can you already feel the chill? Hahaha! Way cheaper than? Marami sila eh… LOL! Pero yes… considering all the features that the Iceberg has, the price is very reasonable. Are you getting one on the 26th? Hey there, Miyer. Great meeting you… Thank you also for dropping by my site. Hope you visit again soon. Who knows, I might meet you also on the 26th if you’re going. Cheers! Hi Sarah. Considering that this phone has an aluminum body, I’m sure it’s more durable than others. From what I’ve heard… the Iceberg has a non-removable battery (similar to the iPhone). nice review chuckie, hoping to see you on the 26th. 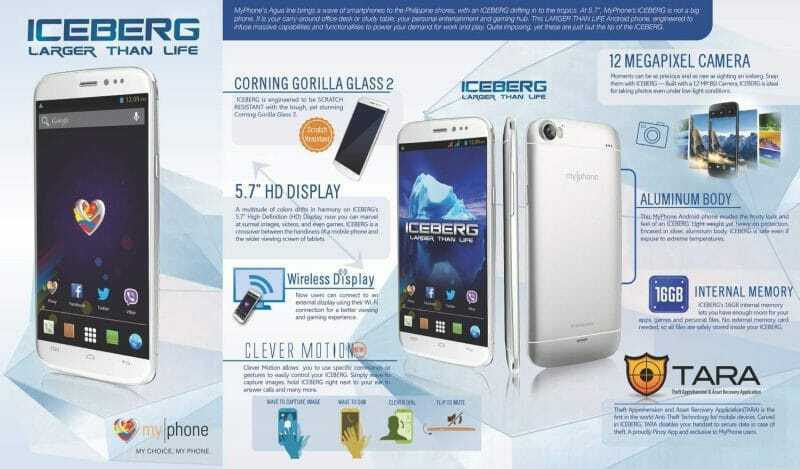 MYPHONE ICEBERG value for our money. Thanks! Yeah… see you on the 26th. OH PROMO LANG PO SA JULY26?/? Promo is only on July 26 and only at Eastwood. That’s what I know. Ayaw mo ba ang map sa likod? anyway, sa features naman po nagkakatalo..
abangan ko nlng po ang review nyo..
sa Eastwood City Walk lang ba cla magrerelease ng phone? No. The launch will be held there as well as the promo. sir panu qng masira na ang battery nito?,pwd bng palitan or ipaayos?,.. tnx 4 ur immediate reply sir…Godbless…. hindi ako nakapuna ng event….huhuhu help naman san ako pwde pa makabili neto ? I bought ICEBERG, but i was dissapointed. Sabi nila 16gb ang rom, pero ang TOTAL storage na nakalagay sa settings 14. Di pa yun ang available. Ang available nalang is 12gb. Nireklamo ko sya but they wont allow me to refund.﻿ :( Does anyone have the same experience? I bought ICEBERG, but i was disapointed. Sabi nila 16gb ang rom, pero ang TOTAL storage na nakalagay sa settings 14. Di pa yun ang available. Ang available nalang is 12gb. Nireklamo ko sya but they wont allow me to refund.﻿ :( Does anyone have the same experience? I have 1 already, now question is… Can we update to android kitkat once it’s released? I bought this phone with no regrets but am nervous whether the OS can be upgraded to android whatever-release-there-is in the future.. Watchuthink Chuckie?